VS2012 return to a normal TFS checkin window? VS2012 seems to remove the popup window for TFS check-ins that was in VS2010. It now seems to take over the team explorer tab in my sidebar, and buries the important things - like which files I've changed. Is there any way to return to a normal popup window for check-ins in VS2012? Another method is to use the Productivity Power Tools. This extension adds Windows shell integration so you can perform most of your TFS commands directly from within Windows without even having Visual Studio open. The Power Tools uses the old style windows when used from within Windows shell. Note that this won't work if a solution is not opened, because of the $(SolutionDir) variable. To workaround this, you can hard-code the path to your workspace instead. Additionally, tf.exe can be invoked with 'shelve' argument, which will show the old-style shelving dialog. 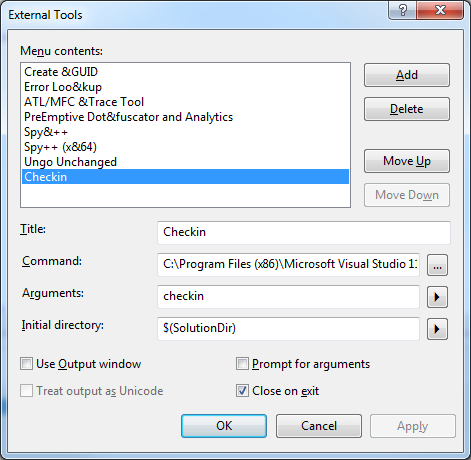 Use tf checkin command from Visual Studio command prompt and you will get the same old checkin window. 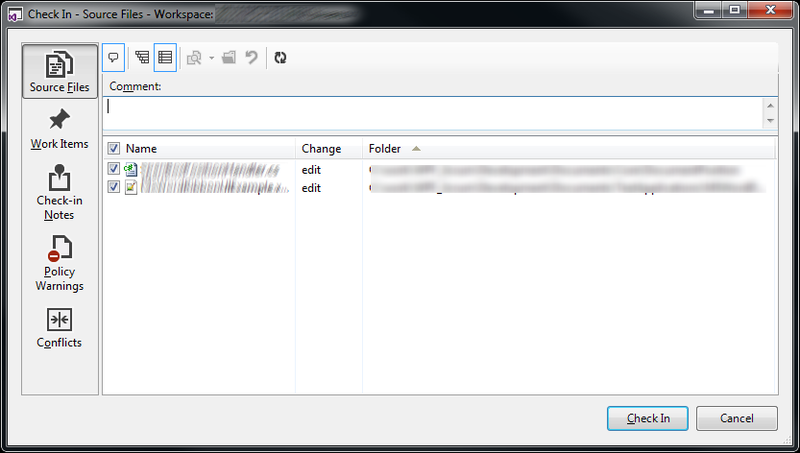 I think the easiest solution is just docking the Team Explorer tab as tabbed document (using the right-click menu). That way it will be equivalent to the popup dialog. Not the answer you're looking for? Browse other questions tagged tfs visual-studio-2012 or ask your own question. Is there a way to use the Visual Studio 2010-style Pending Changes / Team Explorer in Visual Studio 2012? How to display Pending Changes as list rather than tree view in VS2012? How do I configure VS2012 test runner to pick up and run Gallio unit tests? VS2012 SiteMapNode not the same as VS2010?